Cet élégant et pratique appartement en duplex est parfait pour les groupes d’amis qui recherchent un hébergement à long terme dans le centre culturel de Barcelone. A l'entrée se trouve un couloir qui mène à 2 chambres : l'une avec deux lits simples confortables, l'autre avec un grand lit double et une salle de bain rénovée avec une douche dans des tons élégants brun foncé et blanc. Le premier étage est complété d'une cuisine, avec son beau comptoir en granit, parfaitement intégré dans le salon avec table 4 chaises. Un escalier mène à une mezzanine avec 2 lits simples et une vue plongeante sur le salon, qui est meublé d'un élégant canapé noir et décoré avec des photos en noir et blanc d'Audrey Hepburn et Charlie Chaplin. L'appartement dispose également d'un petit balcon privé et d'une terrasse commune, équipée avec une table et des bancs en bois. C’est l'endroit idéal pour profiter d'un bon petit déjeuner avant de partir explorer la ville ! L'appartement est situé dans le pittoresque quartier du Born, à quelques pas de l'Arc del Triomf, du Parc de la Ciutadella, du Musée Picasso et vous trouverez une multitude de magnifiques places aux alentours. Vous séjournerez dans une belle rue avec de nombreux magasins et d'excellents restaurants, tel que “Pique-nique”, célèbre pour son excellent brunch. Le marché de Santa Caterina est un must pour ceux qui préfèrent acheter des aliments frais et les cuisiner à la maison. Vous serez également bien connecté au reste de la ville, avec la station de métro. Hi Dina, thank you kindly for your feedback! We are glad to know that you liked it and that everything went well during your stay. It was really nice experience. Apartment itself is enough even for a big family.The customer service is also fantastic. Please improve the router, change a cleaning lady and everything is going to be perfect! Volveramos pronto! It was fantastic to have you hosted in our apartment. We apologize for the little inconveniences and we wish to see you soon! Sono stato a Barcellona per festeggiare il mio compleanno in questo appartamento con degli amici e ci siamo trovati benissimo. L\' appartamento è situato nel Born a pochi passi dall\' Arc de Triomf e dal barrio Gotico. E\' una zona molto viva ma dopo una certa ora non molto rumorosa. L\' appartamento è molto moderno e ben fornito. Ve lo consiglio! Non ho nessun consiglio da dare; è una buona casa per fare una vacanza a Barcellona, vicino alla metro, vicino all\'arco e alla rambla. E\' stata una bella esperienza. Everything was as it is in the photos, only problem for us was one bathroom to 8 girls. Other than that all was perfect, we were met at the Office by a very friendly woman, who gave us loads of helpful information about what was happening in Barcelona at weekends. For a big group on a budget this place is a winner! Cet appartement est très bien pour une famille avec deux enfants car il y a un lit double et deux lits simple. Le quartier est très joli et animé. Proche de beaucoup de commerces. Cool flat in a good location in Barcelona. Only complaint is that hot water and heat were a bit of an issue, but other than that no problems. Hey Lara! It was great to had you at our apartment. We are really sorry for that little issues, we already fixed the water problems, so we can offer you a 20% discount for your next stay! Just let us know if you plan to stay in Barcelona again! Kind regards. Nice flat, perfect if you are a lot of people. We arrived late at night to Barcelona because of the flight, but we called the landlord and we could still check in the same day. We had to pay for it, but it was good that they had 24/7 check-in. Great place in the lovely Borne neighborhood. The room was very confortable and had all the basics. Not much light during the day, but good to rest. Our host was easy to reach since we wanted to stay extra days in the place. Thanks for everything! This is a great apartment! It's in a convenient location, close to La Rambla and many great sites in Barcelona. Almost anything you might need can be found within a block or two. The sunny patio made for a great spot to take our morning coffee, and we really appreciated the warm welcome. The appartment is perfectly located, we can walk to go out at night, to go walking during the day, the metro station is really close and the streets of the neigborhood look really typical. It's only missing a little bit of light during the day, but we can go on the rooftop upstairs! We had a perfect journey there. Gustavo is a really welcome guy, more than a host he brought us to bars and parties, thank you very much! The studio is great and it has everything you need to live and feel comfortable. 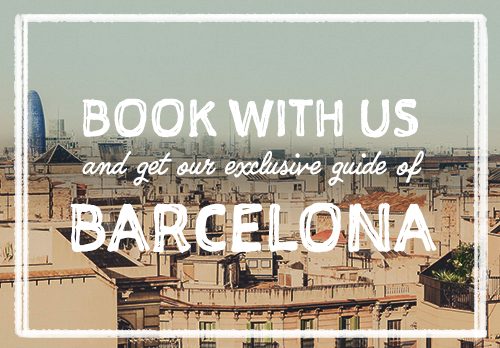 It's located in the heart of Born, one of the most trendy and classic areas of Barcelona. Many good restaurants and bars really near. It's close to two good subway stations, so you can get wherever you want quite easy and quick. The host was formidable. He gave me a map and showed all of the good places to go around town. Was always easy to find and quick to answer to any question or doubt I had. Whenever I needed any tips orwanted to go to a good bar, restaurant or nightclub, he helped me. I definitely recommend the place or any other the host has. It'll surely have a great time in Barcelona! Barcelona was just amazing!! we did not spend much time in our apartment because we saw so much but we had some good night sleeps there! I love this flat, cause was very well furnished ad had all comfort! Also the nightlife here is great:) defo coming back! I was so happy when I finally could find an apartment for so many people, it is not easy to find a place for 11 persons!! We had a good stay, thank you! Hello Margaretha! It was also a pleasure to have you guys here. Thank you for your visit and the review and we hope to see you again soon! The location was brilliant - right in the middle of the trendy, cool Bourne area, surrounded by galleries, museums and cafes. The bed was very comfortable. Room was modern and clean. Perfekt for vennegruppe på tur til Barcelona! Vi hadde den beste ferien noensinne med byturer, strandkos og shopping i en av de kuleste byene i Europa. Leiligheten var sinnsykt kul, og når man drar mange sammen kan man virkelig få mye for pengene. Great and big apartment that fits a lot of people!